Valid PhD admission offer from one of the Top 50 QS Ranked (subject wise) Universities of the world, in preferred subject areas. Maximum age of 35 years on 22nd April 2019. Secure admission in Top 50 OS Ranked (subject wise) Universities of the world in the preferred subject areas as mentioned above. Send duly filled application form to PEEF within due date. 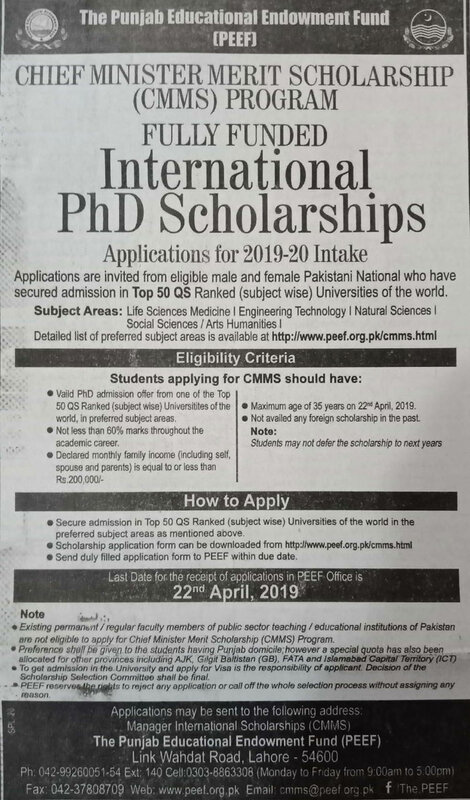 Existing permanent / regular faculty members of public sector teaching I educational institutions of Pakistan are not eligible to apply for Chief Minister Merit Scholarship (CMMS) Program. PEEF reserve to reject any application or call off the whole selection process without assigning any reason.